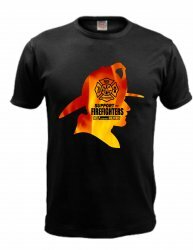 MyMovieMonsters.com: Scary Monsters Gear & T-Shirts! 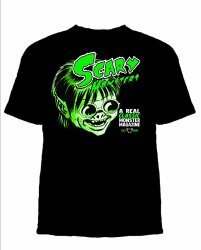 MyMovieMonsters.com > Scary Monsters Gear & T-Shirts! Show your Scary love by sporting our latest retro Monster-Kid T-Shirt just $20 with FREE U.S. Shipping. Now in Black by popular demand in two styles. Send us your photo modeling your Scary Monsters Tee and we'll post it here and print it in a subsequent issue of Scary Monsters as well! 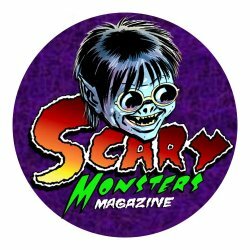 Scary Monsters Fan Club Official Pin-Back Buttons - Five Designs! Proudly display the Scary Monster Kid badge of honor. We consider Scary Monsters Magazine readers an elite group of Monster Kid Royalty, so why not dress like it? 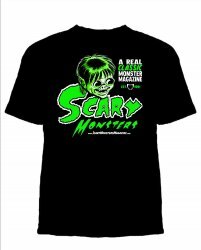 Send us your photo modeling your Monster Kid T-shirt and we'll post it here and print it in our next issue of Scary Monsters as well! 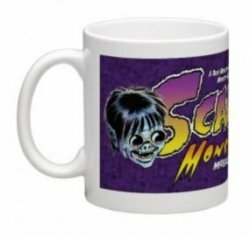 Start your day off right with your favorite cup of Joe in your favorite Sam Scare, monster-kid magazine coffee cup! Cool wraparound design! 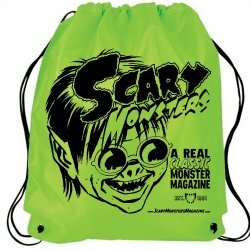 Bring your Scary reading material with you in your Scary Monsters Cinch-Up Back Pack Tote! 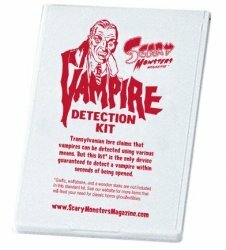 Scary Monsters Vampire Detection Kit! Although not traditionally regarded as an apotropaic, mirrors have been used to ward off vampires when placed, facing outwards, on a door (vampires do not have a reflection and sometimes do not cast a shadow, perhaps as a manifestation of the vampire's lack of a soul). Endorsed by Van Helsing as an absolute necessity to add to a slayer's arsenal.